My timing, I realize, could not be much worse on this post. All around the blogosphere I’m reading that folks are ready to close the door on summer and embrace all things fall. You know, things like pumpkins, tall leather boots, chunky sweaters, and hearty soups and stews. But you know what? Let’s not jump the gun on this thing. My vote is that we all wait until September 22nd to welcome fall and instead break out our ice cream makers for one last hurrah. This recipe is worth it, I promise. 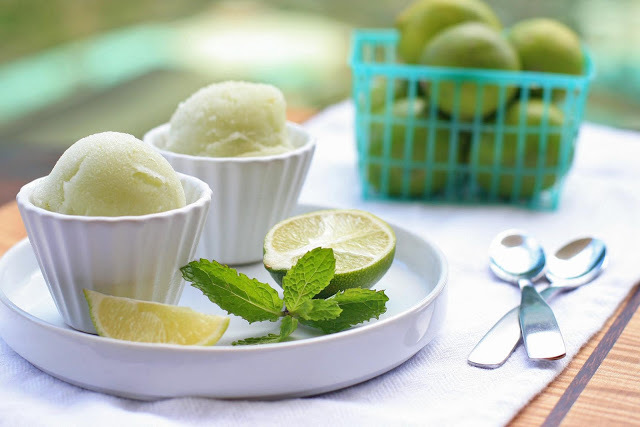 Existing somewhere on the spectrum between a mojito and a caipirinha, the base of this sorbet is made from lime juice, lime zest, sugar and mint. 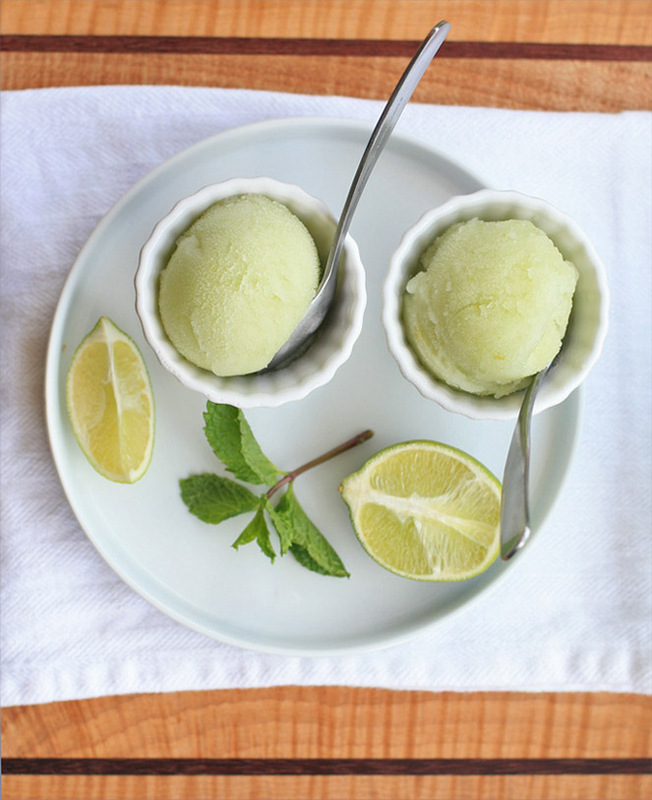 It’s pleasantly tart and minty, a perfect palate cleanser. 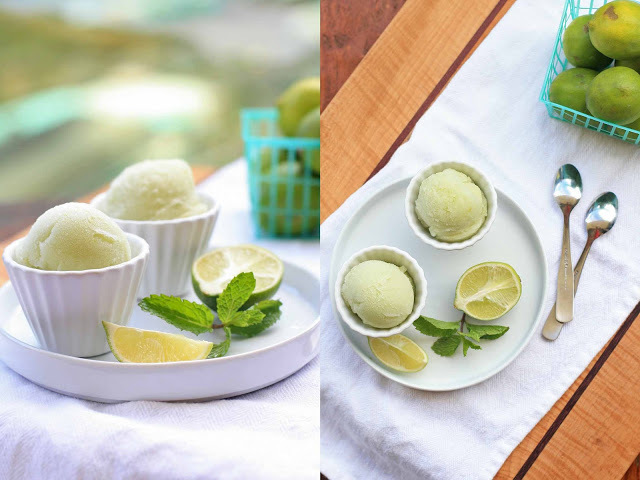 The smidgen of liquor has a duel purpose: it gives the sorbet just the slightest bit of edge and gives the sorbet a nice, scoopable texture just out of the freezer. I used cachaça but you’re welcome to use rum if that’s all you have on hand. Combine the sugar, water and mint in a small saucepan over medium heat. Cook, stirring, until the sugar dissolves. Bring to a boil and let simmer for 3-4 minutes without stirring. Remove from heat and let cool for at least 30 minutes. 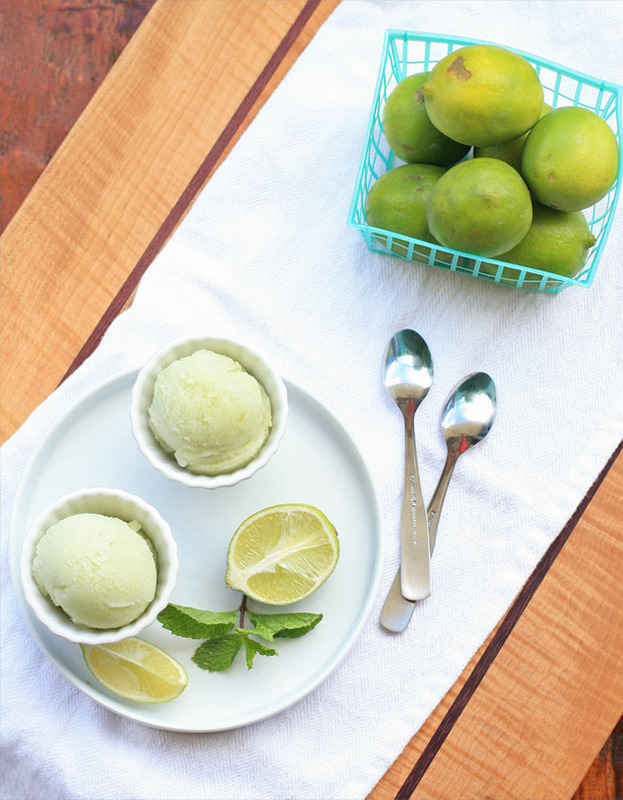 Strain the mixture into a bowl, discarding the mint sprigs, and add the lime juice, zest, cachaça, corn syrup and food coloring, if using. Cover and chill until the mixture is very cold.